Along with such titles as The Hobbit, A Wizard of Earthsea, Harry Potter and the Sorcerer's Stone, and The Book of Three, Madeleine L'Engle's A Wrinkle in Time is mandatory reading for young geeks in training. The book's reputation as "unfilmable" (enhanced by the colossal failure of a 2003 made-for-TV flop) is deserved and this lavish new version, featuring A-list talent and shepherded by acclaimed director Ava DuVernay (Selma), does nothing to change that. Saddled with an unevenly paced screenplay and overly reliant on generic CGI, A Wrinkle in Time argues that the only way to experience the universe envisioned by L'Engle is through her writing. Although advertised as a family-friendly feature, A Wrinkle in Time is a poor choice for younger children. The glacial pacing of the first half-hour, coupled with less-than-easily-digestible chunks of exposition will cause many kids under 10 (and a few adults as well) to squirm in their seats with impatience. Not until the movie reaches its midpoint and the main story kicks into gear does the film's narrative accelerate. DuVernay's strength with interpersonal relationships and character-building is evident. The strongest scenes are the most intimate ones, including a moment between Storm Reid and Chris Pine that brings tears to the eyes. Unfortunately, DuVernay is unable to present the backstory in a compelling fashion and she's out of her depth when choreographing lengthy CGI sequences. She makes the key mistake of believing that just because the screen is filled with wondrous special effects that the audience is going to be awestruck. Eye candy doesn't equate to immersion; in fact, as boredom sets in, the impact is the opposite. Jennifer Lee and Jeff Stockwell's script encapsulates most of the book's main plot points while losing far too many of the details. The resulting story feels rushed and artificial and lacks the charm and wonder of the novel. Storm Reid is magnificent as Meg; many scenes work because she sells them with an unforced performance and innate charisma. Also impressive are Chris Pine and Gugu Mbatha-Raw as her parents, although their scenes are limited. Sadly, three key supporting characters - Oprah Winfrey as the regal Mrs. Which, Reese Witherspoon as the flaky Mrs. Whatsit, and Mindy Kaling as the sedate Mrs. Who - are miscast. Mrs. Which is eclipsed by Winfrey's personality - the character can't escape from the actor's shadow. Mrs. Whatsit comes across like a poor person's Glenda the Good Witch. And Mrs. Who seems largely pointless. These characters add little more to the movie that famous faces moving the plot in a preordained direction. As the movie opens, we're in DuVernay's wheelhouse with A Wrinkle in Time presenting Meg's background. Once a good student, she has become sullen and withdrawn since the disappearance four years ago of her scientist father. A believer in the power of the wormhole-like tesseract to allow him to explore the universe, he vanished one day, never to return. The arrival of the mysterious Mrs. Whatsit in the neighborhood perturbs Meg and her mother, but leaves her super-genius younger brother, Charles Wallace (Deric McCabe), unfazed. Mrs. Whatsit is soon joined by her cohorts, Mrs. Which and Mrs. Who, and present to Meg with a way to find her father. Accompanied by Charles Wallace and a school friend, Calvin (Levi Miller), she reluctantly enters a tesseract and finds herself on a distant planet. There, she discovers the first clue about what happened to her father - it involves a mystical being of great evil, called only "The It," which spews its poison throughout the universe. To pursue a rescue, Meg and her companions must venture to a planet at the heart of the darkness and find a way to overcome what they encounter there. Following a lugubrious beginning, A Wrinkle in Time settles into a groove, although many of the few action sequences (especially the climactic one) feel like outtakes from a Marvel superhero movie. The final solution, which involves the power of love, is less convincing on screen than in the novel. In fact, that's a recurring problem with the movie. Things that work on the written page as a result of L'Engle's strength as a storyteller often feel false or contrived in the film. That's partly because the limitations of a 109-minute running time disallow the level of exploration demanded by the narrative and partially because tethering the imagination to CGI images rarely results in anything less than a disappointment. A Wrinkle in Time feels like a labor of love and, on those occasions when it works - primarily the "small" moments when special effects take a back seat to genuine expressions of emotion and humanity - it offers a glimpse of what they filmmakers were striving for. 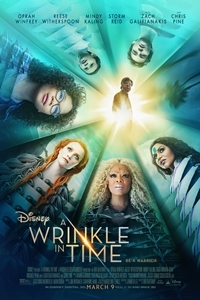 Unfortunately, the slow pace of the first hour coupled by the tedium of a CGI overload, reduces A Wrinkle in Time to one of Disney's most lackluster big-budget releases since The BFG.